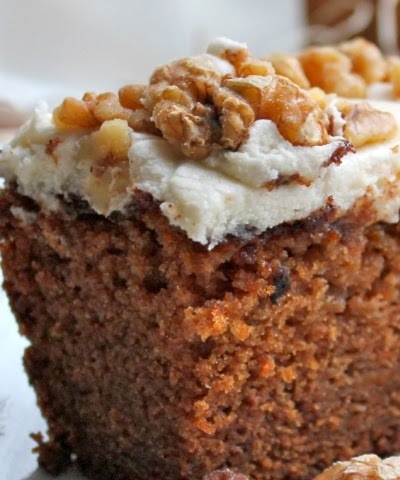 Growing up, friends and family usually raved about my mom's delicious carrot cake. As a child, the thought of eating a cake made from carrots seemed a bit odd, but once I got past the initial apprehension, I too found her carrot cake to be 1 of my favorite desserts. Below is the exact recipe. I hope you appreciate it! Mix the sugar and vegetable oil in a big bowl. Add the eggs and vanilla, along with self-rising flour and cinnamon. Making use of a Kitched Aid or other mixing device, add the baking soda and carrots and mix until the batter is uniform. Pour batter into three round cake pans (makes three layers). Bake at 350 degrees for 30 minutes. Once done, put on racks to cool. To create the icing, combine the cream cheese, margarine, powdered sugar, and vanilla, and mix until consistent. Add the chopped peacans and stir. Apply the icing in between layers and on the top and sides of the cake once the layers have cooled. Finally, get pleasure from 1 of the finest tasting desserts ever created!